Jason Cohen and I have something in common...we both like bourbon. For me, that entails sitting atop a bar stool. For Jason, this translates into making the bar stool. Utilizing white oak bourbon barrels, Jason handcrafts gorgeous furniture that serves its function in a very stylish, intriguing way. I first saw Jason's work in Garden & Gun last year and tore out the magazine page to ensure I blogged about it someday. Jason sources his barrels from Bourbon Barrel Foods, just down the block from his workshop in Louisville, Kentucky. White Oak is a hardy wood, yet one may question how sturdy furniture made from the rounded barrels can be. Not to worry...As Jason shared with Garden & Gun, "The wood has been trained for years to that form and it makes it strong. It's green when they cut it, and then they pour liquor in it. It's almost petrified." 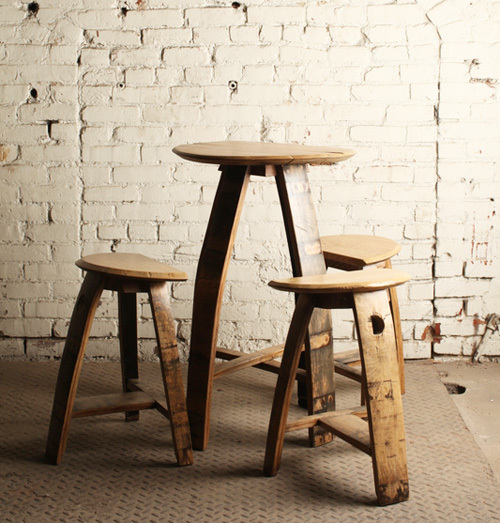 This small stool was inspired by an antique milking stool. As each item is handcrafted individually, no two of Jason's pieces are exactly alike and all have a unique patina and look of their own. Click here, then on the Bourbon Barrel Furniture link to see all of Jason's creations inspired by Kentucky's most famous spirit. Like I said, I'm a fan of bourbon, specifically the delightful concoctions I've found at Abattoir or HD1 in Atlanta...just mix with herbs and fresh berries or a bit of citrus and I'm a happy girl. I like a few of Bulleit's recipes too, found here. A couple tasty cocktails would look so good atop a Jason Cohen table, don't you think?